Share the intimate Pump Room experience back stage at the 2000 Olympia in Las Vegas. It’s every man for himself in the tense moments before their on-stage battle for bodybuilding’s ultimate prize – THE 2000 MR. OLYMPIA TITLE!! In particular we feature the pump room preparation of Günter Schlierkamp, Jay Cutler, Nasser El Sonbaty, Lee Priest, Markus Rühl, Orville Burke & Kevin Levrone. This was the closest Kevin came to winning Mr Olympia. His condition was sensational. It took the incredible size, shape and condition of Ronnie to deny him the title. This is the Ultimate Mr. Olympia Pump Room Set of DVDs! Here is Pump Room DVD #1. 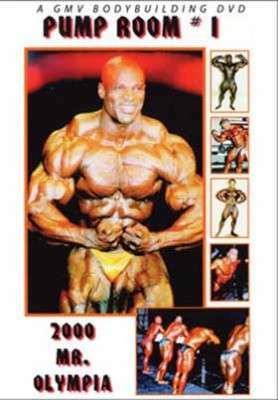 Share the intimate Pump Room experience back stage at the 2000 Olympia in Las Vegas. It’s every man for himself in the tense moments before their on-stage battle for bodybuilding’s ultimate prize – THE 2000 MR. OLYMPIA TITLE!! Shot with 2 cameras, DVD # 1 (of 2) is primarily the Pump Room during rounds 1 and 2 of the Prejudging. In particular we feature the pump room preparation of Günter Schlierkamp, Jay Cutler, Nasser El Sonbaty, Lee Priest, Markus Rühl, Orville Burke & Kevin Levrone. This was the closest Kevin came to winning Mr Olympia. His condition was sensational. It took the incredible size, shape and condition of Ronnie to deny him the title. Also includes the overtaping of the official photographer’s booth back stage, with Ronnie Coleman and all the other Olympia stars!! See the superstars in great closeups as our camera examines every inch of the champion’s bodies, sinew by sinew and striation by striation. More superb closeups below as the guys pose for stills taken by Clive Jaques and Wayne Gallasch.